Whenever I see this picture, I think of “The Scotsman” from Utah State University. It is not the formal fight song, but has been used as a song from the university for over 90 years. Show me the Scotsman who doesn’t love the thistle. Show me the Englishman who doesn’t love the rose. Who doesn’t love the spot . . . Here is a version of it caught by ESPN for your viewing pleasure. You have to be patient to get to it as the broadcast proceeds: ESPN Scotsman. You can see some other videos of the Scotsman from this link. Listening to it and remembering my experiences with the crowd still makes my hair stand on end. Here are a couple of the other chants: Aggie Cheers. This includes the Scotsman, I believe, and Winning Team/Losing Team. The later two chants arose after I graduated in 2005 but show that Aggie spirit is still well and alive. It was not until we arrived in Scotland that we saw the marvel that the Scottish Thistle really is! 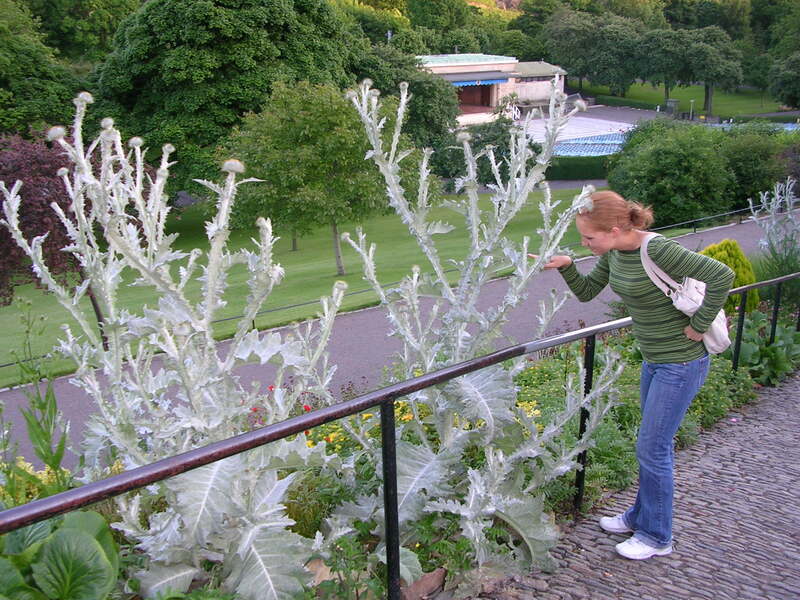 Look at the size of this thistle compared to Amanda, who is 5’6″. Growing up in Idaho we had what we call Canadian Thistle, but it rarely reached half this height. Legend tells that the Scottish were protected by the thistle when conquerors came upon them at night and hoping to attack in stealth. Unfortunately the conquerors were thwarted by the mighty thistle as it caused some of the men to shriek in pain and alerted the clansmen of the impending attack. It has been used as a Scottish emblem since the 13th century. I wonder if the English used the rose for the same reason? I do not think the Aggie will find the sagebrush to be of the same value, unless it is the delayed response of the morning after when the ticks are discovered! At any rate, when in Scotland, stop and smell the thistle (as you can see Amanda doing). I can admit, I love the sagebrush, and I definitely love one of the spots where the sagebrush grows: Logan, Utah. This entry was tagged Logan, Scotland, USU, Utah. Bookmark the permalink.